Type and Characteristics - Single screw, wooden-hulled sloop, Kearsarge-class, built by Merrick and Sons, Philadelphia, PA, laid down 27 June 1861, launched 24 August 1861, commissioned 5 December 1861, 1,457 tons, 198ft 6in long, 33ft beam, 14ft 10in draft, 11kts, armed with 1-30pdr (4.2in) Parrott rifle, 2-11in Dahlgren smoothbore and 6-32pdr guns, first commanded by Cdr Tunis A M Craven. Log Period and Areas of Service - 1861-80, Civil War, European and Atlantic waters, South Pacific Squadron, coasts of Central and South America, Caribbean, North Pacific Station. 5 December 1861 – Sailed for Great Britain, Gibraltar, and Spain in search of CSN ships that had run the US blockade and to protect American shipping. 15 March 1863 – Returned home to patrol the coast from Newfoundland to Bermuda, and then with the North Atlantic Blockading Squadron. 7 October 1863 – Served as a storeship at Beaufort, N.C.
4 June 1864 – Decommissioned at Boston Navy Yard. 3 October 1864 – Reassigned to the North Atlantic Blockading Squadron. 17 January 1865 – Reassigned to the South Atlantic Blockading Squadron. 16 May 1865 – Escorted President Jefferson Davis, his family, and other captured Confederate officials aboard the steamer William P. Clyde from Port Royal to Hampton Roads. 30 May 1865 – Decommissioned at Boston Navy Yard. 2 November 1865 – Sailed for the Pacific Ocean via Cape Horn; served with the South Pacific Squadron. 18 November 1867 – Aided Chile to assist victims of the great earthquake. 12 May 1869 – Sailed for the North Atlantic. 28 July 1869 – Stationed at Aspinwall, Colombia (now Colon, Panama). April 1870 – Stationed at Key West and cruised the Caribbean. 31 January 1871 – Decommissioned at Portsmouth, N.H.
16 May 1872 – Assigned to the South Pacific Station. 25 June 1873 – Arrived at San Francisco and surveyed the sea floor off the northwest coast to determine a suitable route for a submarine cable. January 1874 – Tuscarora took soundings for a submarine cable route between the United States, Japan, and China; transferred to the North Pacific Station. September 1875 – Performed survey work in the South Pacific. 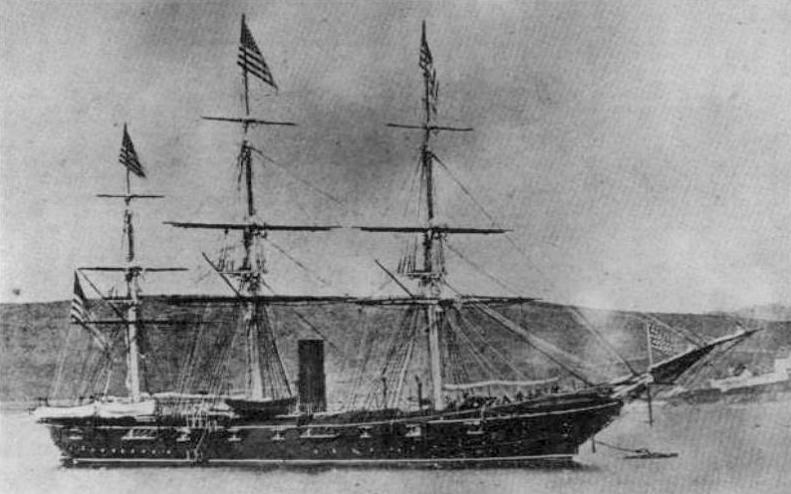 14 September 1876 – Decommissioned at the Mare Island Navy Yard for repairs. 10 January 1878 – Recommissioned and assigned to special oceanic survey work off the western coasts of both Central and South America. 21 April 1880 – Returned to Mare Island Navy Yard for repairs. Fate - Decommissioned at Mare Island on May 1880 for repairs, which were never completed, struck from Naval List in 1883, sold at Mare Island in November 1883.